An amazing eye-catching carport ‘Giraffe 2.0’ by InnoVentum is a hybrid solar and wind electric vehicle charger & power station for residential as well as industrial use. Giraffe 2.0 combines clean energy, covered parking, and very attractive design of the product. 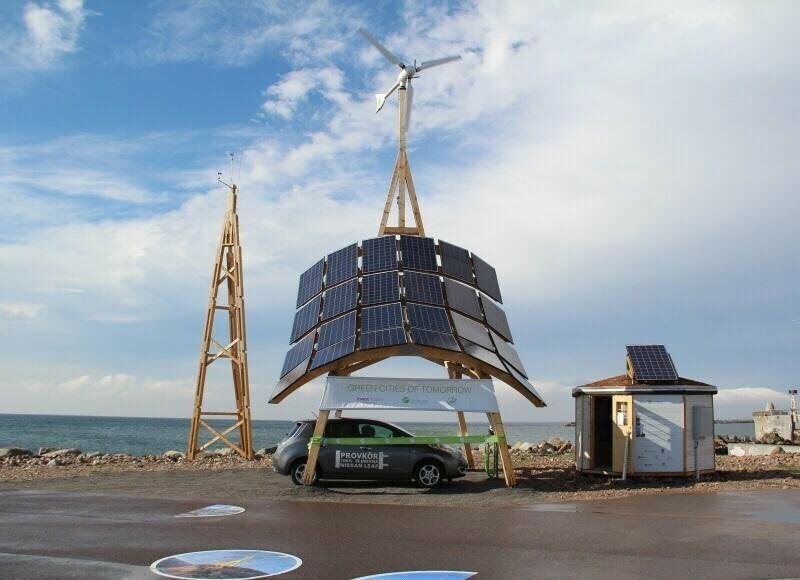 Integration of both solar array and a small wind turbine onto a wooden carport and tower makes it very efficient energy source. It's made of renewable (wood) and recycled (metal) materials for the main construction and requires no concrete, both of which keep the carbon footprint down and bring green power station to the next level of sustainability. The trees used for the structure have absorbed several tons of CO2 from the atmosphere before their wood takes the unique shape of a Giraffe. It can charge your e-car in just a couple of hours and other option, if you don’t have e-car is to plug-in hybrid. The Giraffe comprises of 3.5 kW wind turbine, 24 PV panels (6 kWp), 24 micro-inverters and one wind inverter including wooden structure. A unique thing about Giraffe is its energy flexibility; you can connect it directly to the utility grid and power your home or install an off-grid Giraffe 2.0 where the grid is not available. Intelligent positioning of PV panels in 20 different angles allows for stable energy generation with additional four hours compared to a classic flat PV mounting. It generates energy for more than a 225 km e-drive per day and in a year it produces enough energy to drive twice around the world. The installation is estimated to have an annual production of some 13,850 kWh of electricity. Continuity of power production due to hybrid, wind and solar energy combination provides energy day and night, summer and winter.